SUPREME COURT OF INDIABefore :- Arijit Pasayat and H.K. Sema, JJ. For the Petitioner :- Petitioner-in-Person. 1. A. Thangal Kunju Musaliar v. M. Venkatachalam Potti, Authorised Official and Income-tax Officer, AIR 1956 SC 246. 2. Budhan Choudhry v. State of Bihar, AIR 1955 SC 191. 3. Mafatlal Industries Ltd. v. Union of India, 1997(5) SCC 536. 4. Collector of Customs v. Nathella Sampathu Chetty, 1962(3) SCR 786. 5. State of Rajasthan v. Union of India, 1977(3) SCC 592. 6. Commissioner, H.R.E. v. Sri Lakshmindra Thirtha Swamiar of Sri Shirur Meth, 1954 SCR 1005. 7. Maulavi Hussein Haji Abraham Umarji v. State of Gujarat, 2004(3) RCR(Crl.) 855 (SC) : 2004(6) SCC 672. 8. Unique Butle Tube Industries (P) Ltd. v. U.P. Financial Corporation, 2003(2) SCC 455. 9. Padma Sundara Rao (dead) v. State of T.N., 2002(3) SCC 533. 10. Savitri Devi v. Ramesh Chand, SLP(Crl.) .... of 2003, decided on 28.11.2003. Arijit Pasayat, J. - By this petition purported to have been filed under Article 32 of the Constitution of India, 1950 (in short 'the Constitution') prayer is to declare Section 498-A of Indian Penal Code, 1860 (in short 'the IPC') to be unconstitutional and ultra vires in the alternative to formulate guidelines so that innocent persons are not victimized by unscrupulous persons making false accusations. 2. Further prayer is made that whenever, any Court comes to the conclusion that the allegations made regarding commission of offence under Section 498-A IPC are unfounded, stringent action should be taken against person making the allegations. This, according to the petitioner, would discourage persons from coming to Courts with unclean hands and ulterior motives. Several instances have been highlighted to show as to how commission of offence punishable under Section 498-A IPC has been made with oblique motives and with a view to harass the husband, in-laws and relatives. 3. According to the petitioner there is no prosecution in these cases but persecution. Reliance was also placed on a decision rendered by a learned Single Judge of the Delhi High Court wherein concern was shown about the increase in number of false and frivolous allegations made. It was pointed out that accusers are more at fault than the accused. Persons try to take undue advantage of the sympathies exhibited by the Courts in matters relating to alleged dowry torture. 4. Section 498-A appears in Chapter XXA of IPC. 5. Substantive Section 498-A and presumptive Section 113-A of the Indian Evidence Act, 1872 (in short 'Evidence Act') have been inserted in the respective statutes by Criminal Law (Second Amendment) Act, 1983. 6. Section 498-A IPC and Section 113-B of the Evidence Act include in their amplitude past events of cruelty. 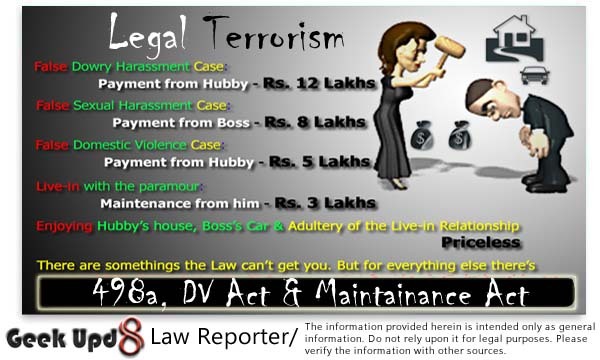 Period of operation of Section 113-B of the Evidence Act is seven years, presumption arises when a woman committed suicide within a period of seven years from the date of marriage. "498-A : Husband or relative of husband of a woman subjecting her to cruelty - Whoever, being the husband or the relative of the husband of a woman, subjects such woman to cruelty shall be punished with imprisonment for a term which may extend to three years and shall also be liable to fine. "113-B : Presumption as to dowry death - When the question is whether a person has committed the dowry death of a woman and it is shown that soon before her death such woman has been subjected by such person to cruelty or harassment for, or in connection with, any demand for dowry, the Court shall presume that such person had caused the dowry death. Explanation - For the purposes of this section 'dowry death' shall have the same meaning as in Section 304-B of the Indian Penal Code (45 of 1860)." 7. Consequences of cruelty which are likely to drive a woman to commit suicide or to cause grave injury or danger to life, limb or health, whether mental or physical of the woman is required to be established in order to bring home the application of Section 498-A IPC. Cruelty has been defined in the explanation for the purpose of Section 498-A. It is to be noted that Sections 304-B and 498-A IPC cannot be held to be mutually inclusive. These provisions deal with two distinct offences. It is true that cruelty is a common essential to both the sections and that has to be proved. The explanation to Section 498-A gives the meaning of 'cruelty'. In Section 304-B there is no such explanation about the meaning of 'cruelty'. But having regard to common background to these offences it has to be taken that the meaning of 'cruelty' or 'harassment' is the same as prescribed in the Explanation to Section 498-A under which 'cruelty' by itself amounts to an offence. 8. The object for which Section 498-A IPC was introduced is amply reflected in the Statement of Objects and Reasons while enacting Criminal Law (Second Amendment) Act No. 46 of 1983. As clearly stated therein the increase in number of dowry deaths is a matter of serious concern. The extent of the evil has been commented upon by the Joint Committee of the Houses to examine the work of the Dowry Prohibition Act, 1961. In some cases, cruelty of the husband and the relatives of the husband which culminate in suicide by or murder of the helpless woman concerned, which constitute only a small fraction involving such cruelty. Therefore, it was proposed to amend IPC, the Code of Criminal Procedure, 1973 (in short 'the Cr.P.C.') and the Evidence Act suitably to deal effectively not only with cases of dowry deaths but also cases of cruelty to married women by the husband, in-law and relatives. The avowed object is to combat the menace of dowry death and cruelty. 9. One other provision which is relevant to be noted is Section 306 IPC. The basic difference between the two sections i.e. Section 306 and Section 498-A is that of intention. Under the latter, cruelty committed by the husband or his relations drag the women concerned to commit suicide, while under the former provision suicide is abetted and intended. 10. It is well settled that mere possibility of abuse of a provision of law does not per se invalidate a legislation. It must be presumed, unless contrary is proved, that administration and application of a particular law would be done "not with an evil eye and unequal hand" [See : A. Thangal Kunju Musaliar v. M. Venkatachalam Potti, Authorised Official and Income-tax Officer and another, AIR 1956 SC 246]. 11. In Budhan Choudhry and others v. State of Bihar, AIR 1955 SC 191 a contention was raised that a provision of law may not be discriminatory but it may land itself to abuse bringing about discrimination between the persons similarly situated. This Court repelled the contention holding that on the possibility of abuse of a provision by the authority, the legislation may not be held arbitrary or discriminatory and violative of Article 14 of the Constitution. 12. From the decided cases in India as well as in United States of America, the principle appears to be well settled that if a statutory provision is otherwise intra vires, constitutional and valid, more possibility of abuse of power in a given case would not make it objectionable, ultra vires or unconstitutional. In such cases, "action" and not the "section" may be vulnerable. If it is so, the Court by upholding the provision of law, may still set aside the action, order or decision and grant appropriate relief to the person aggrieved. "The possibility of abuse of a statute otherwise valid does not impart to it any element of invalidity." It was said in State of Rajasthan v. Union of India, 1977(3) SCC 592 "it must be remembered that merely because power may sometimes be abused, it is no ground for denying the existence of power. The wisdom of man has not yet been able to conceive of a Government with power sufficient to answer all its legitimate needs and at the same time incapable of mischief." (Also see : Commissioner, H.R.E. v. Sri Lakshmindra Thirtha Swamiar of Sri Shirur Meth, 1954 SCR 105). 14. As observed in Maulavi Hussein Haji Abraham Umarji v. State of Gujarat, 2004(3) RCR(Crl.) 855 (SC) : 2004(6) SCC 672; Unique Butle Tube Industries (P) Ltd. v. U.P. Financial Corporation and others, 2003(2) SCC 455 and Padma Sundara Rao (dead) and others v. State of T.N. and others, 2002(3) SCC 533, while interpreting a provision, the Court only interprets the law and cannot legislate it. If a provision of law is misused and subjected to the abuse of the process of law, it is for the legislature to amend, modify or repeal it, if deemed necessary. "Heard learned counsel for the petitioner. We do not see any merit in the challenge made to the order of the High Court in Criminal Revision No. 462 of 2002, on the facts of the case. The special leave petition is, therefore, dismissed. At the same time, we express our disapproval of some of the generalized views expressed in paragraphs 23 to 32 of the judgment of the High Court by the learned Single Judge. The learned Judge ought to have seen that such observations, though may be appropriate for seminars or workshops, should have been avoided being incorporated as part of a Court judgment. Some of the views also touch upon Legislative measures and wisdom of legislative policy in substance, which according to the learned Judge need to be taken into account. There was no scope for considering all such matters in the case which was before the learned Judge. It is, therefore, appropriate that such generalized observations or views should be meticulously avoided by Courts in the judgments." 16. Above being the position we find no substance in the plea that Section 498-A has no legal or constitutional foundation. 17. The object of the provision is prevention of the dowry menace. But as he has been rightly contended by the petitioner many instances have come to light where the complaints are not bonafide and have been filed with oblique motive. In such cases acquittal of the accused does not in all cases wipe out the ignomy (ignominy ?) suffered during and prior to trial. Sometimes adverse media coverage adds to the misery. The question, therefore, is what remedial measures can be taken to prevent abuse of the well-intentioned provision. Merely because the provision is constitutional and intra vires, does not give a licence to unscrupulous persons to wreck personal vendetta or unleash harassment. It may, therefore, become necessary for the legislature to find out ways how the makers of frivolous complaints or allegations can be appropriately dealt with. Till then the Courts have to take care of the situation within the existing framework. As noted above the object is to strike at the roots of dowry menace. But by misuse of the provision a new Legal Terrorism can be unleashed. The provision is intended to be used a shield and not an assassin's weapon. If cry of "wolf" is made too often as a prank, assistance and protection may not be available when the actual "wolf" appears. There is no question of investigating agency and Courts casually dealing with the allegations They cannot follow any straitjacket formula in the matters relating to dowry tortures, deaths and cruelty. It cannot be lost sight of that ultimate objective of every legal system is to arrive at truth, punish the guilty and protect the innocent. There is no scope for any pre- conceived notion or view. It is strenuously argued by the petitioner that the investigating agencies and the Courts start with the presumptions that the accused persons are guilty and that the complainant is speaking the truth. This is too wide available and generalized statement. Certain statutory presumptions are drawn which again are rebuttable. It is to be noted that the role of the investigating agencies and the Courts is that of watch dog and not of a bloodhound. It should be their effort to see that an innocent person is not made to suffer on account of unfounded, baseless and malicious allegations. It is equally undisputable that in many cases no direct evidence is available and the Courts have to act on circumstantial evidence. While dealing with such cases, the law laid down relating to circumstantial evidence has to be kept in view. 18. Prayer has been made to direct investigation by the Central Bureau of Investigation (in short the 'CBI') in certain matters where the petitioner is arrayed as an accused. We do not find any substance in this plea. If the petitioner wants to prove his onnocence, he can do so in the trial, if held.